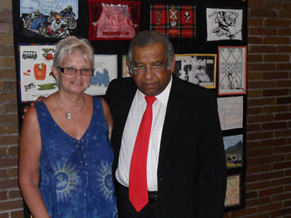 Hanef Bhamjee from ACTSA Wales presented a cheque to Niki in Pietermaritzburg for R6800. Thank you to our ACTSA supporters in Wales. 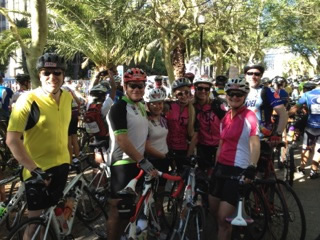 A group of supporters took part in the Cape Argus Cycyle ride, raising a phenomenal £19546 (approx R270000) for Zisize! A huge thank you to Gareth, Kate & Ella Penny, Giles & Dani Neville, Stephanie & Beetle Pardoe, Miranda,Andrew & Nix Perrott and their friends, colleagues and families who sponsored them. April 2013. Four Ingwavuma children, who attended Zamimpilo Special School as boarders, were killed when the bus in which they were travelling from a sports event at Richards Bay crashed, killing eight children and injuring 19 others and a teacher. Our sincere condolences to their families. All the children had been placed at the school by Zisize's psychologist, so we share their grief. May 2013. Xola Nyawo, who had been sponsored at University of Zululand by Zisize supporters has just heard that following his graduation as a Bachelor of Education, he has been offered a teaching post at Mbalekelwa Primary School. Congratulations! May 2013. 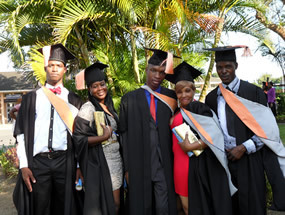 Five young people from the Ingwavuma area, whom Zisize has supported through University, were awarded their BA degrees at University of Zululand! It was a wonderful day and a phenomenal achievement. Sphiwe & Dennis have been supported by Zisize since they were orphaned at primary school; Phineas has lived at Ekukhanyeni during his high school and university years; Ncami was a relief mentor for Zisize prior to attending university, so we have a close, long term and personal relationship with all of them. Thandukukhanya has also achieved against huge odds. All of them are now studying for their PGCE so that they can return to teach in Ingwavuma. Sphiwe Mdluli BA; Phineas Mafuleka BA.